Treatment of severely resorbed edentulous alveolar ridges is still a challenging topic of prosthodontics. Combination Syndrome is one of the most remarkable intraoral manifestations of excessive alveolar bone resorption which may be observed at the denture wearing patients with complete edentulous maxilla and bilateral partial edentulous mandibula. Since its first recognition in 1972, the major symptoms and morphological features of the Combination Syndrome such as enlarged maxillary tuberosities and resorbed edentulous ridges were often portrayed as being bilaterally located in either sides of the midsagittal plane. The aim of the present study was to describe a rarely seen alveolar bone resorption pattern mimicking the Combination Syndrome and to report the prosthetic treatment approach applied for its rehabilitation. Kelly E. Changes caused by a mandibular removable partial denture opposing a maxillary complete denture. J Prosthet Dent 1972;27:140-150. Palmqvist S, Carlsson GE, Öwall B. The combination syndrome: a literature review. J Prosthet Dent 2003;960:270-275. Shen K, Gongloff RK. Prevalence of the combination syndrome among denture patients. J Prosthet Dent 1989;62:642-644. Salvador MCG, do Valle AL, Riberio MCM, Pereira JR. Assessment of the prevalence index on signs of combination syndrome in patients treated at Bauru School of Dentistry, University of Sao Paulo. J Appl Oral Sci 2007;15(1):9-13. Klemetti E, Lassila L, Lassila V. Biometric design of complete dentures related to residual ridge resorption. J Prosthet Dent 1996;75:281-284. Tymstra N, Raghoebar GM, Vissink A, Meijer HJA. Maxillary anterior and mandibular posterior ridge resorption in patients wearing a mandibular implant-retained overdenture. J Oral Rehabil 2011;38:509-516. Carlsson GE. Clinical morbidity and sequelea of treatment with complete dentures. J Prosthet Dent 1997;79:17-23. Bindhoo YA, Thirumurthy VR, Kurien A. Complete mucostatic impression. A new attempt. J Prosthodont 2012;21:209-214. Mori S, Sato T, Hara T, Nakashima K, Minagi S. Effect of continous pressure on histopathological changes in denture-supporting tissues. J Oral Rehabil 1997;24:37-46. Arksornnukit M, Thitima P, Takahashi H. Pressure transmission and distrubution under denture bases using denture teeth with different materials and cuspal angulations. J Prosthet Dent 2011;105:127-136. Ohguri T, Kawano F, Ichikawa T, Matsumoto N. Influence of occlusal scheme on the pressure distrubition under a complete denture. Int J Prosthodont 1999;12:353-358. 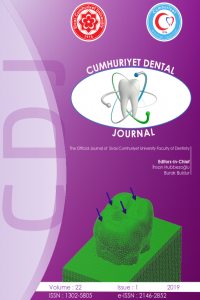 Inoue S, Kawano F, Nagao K, Matsumoto N. An in vitro study of the influence of occlusal scheme on the pressure distribution of complete denture supporting tissues. Int J Prosthodont 1996;9:179-187. Jameson WS. The use of linear occlusion to treat a patient with combination syndrome: A clinical report. J Prosthet Dent 2001;85:15-9.